HOME » TRAIN TOURS » TRANS SIBERIAN RAILWAY BY PRIVATE "IMPERIAL TRAIN"
TRANS SIBERIAN RAILWAY BY PRIVATE "IMPERIAL TRAIN"
Explore Transsiberian route - thousands of kilometers from the shores of the Baltic Sea to the Pacific Ocean, through Europe and Asia - three largest countries in the world - Russia, Mongolia and China. Eastbound Direction. Explore Transsiberian route - thousands of kilometers from the shores of the Baltic Sea to the Pacific Ocean, through Europe and Asia - three largest countries in the world - Russia, Mongolia and China. Westbound direction. 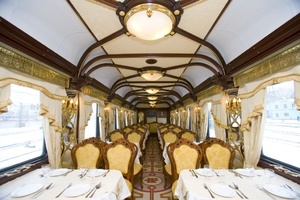 Transsiberian high-comfort private train from Moscow to Vladivostok. Good quality combined with reasonable rates makes it the most economical private train tour in Russia. Meals and sightseeing are included. The train has a restaurant car,onboard entertainment and first aid medical assistance. Higher category cabins have private showers. 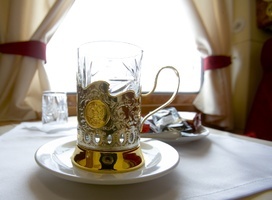 Transsiberian high-comfort private train from Vladivostok to Moscow. 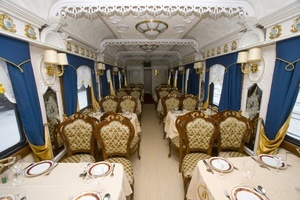 Good quality combined with reasonable rates makes it the most economical private train tour in Russia. Meals and sightseeing are included. 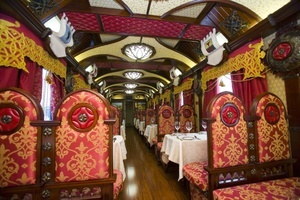 The train has a restaurant car,onboard entertainment and first aid medical assistance. Higher category cabins have private showers.